Question: Are you annoyed with the huge arrows that on the desktop icons in Windows Vista? They cover nearly a quarter of the icon! I want to remove the arrows! 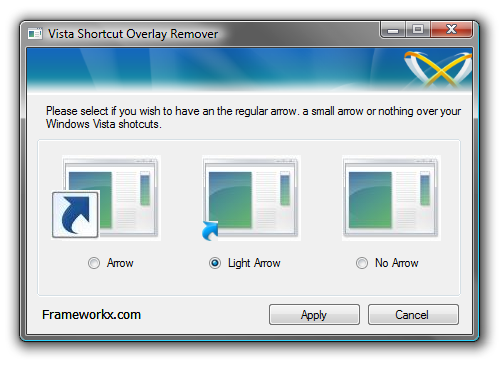 Shortcut Overlay Remover’. This program will give you the choice to either make the arrows on the icons smaller or fully remover them. To download this free software, click HERE. Entry filed under: freeware, Software, Tune up, Vista, Windows.